Breakfast. The most important meal of the day, right? Also, the hardest one to squeeze in. I am just not a morning person. Mornings should be spent curled up in bed, not running around trying to look presentable and pack a lunch and brew coffee AND make breakfast. Like, how many things am I expected to do before I’ve ingested a proper level of caffeine? So I’ve been buying these frozen breakfast burritos from Target. They’re great. And they’re not crazy expensive, but I decided I wanted to see if I could make my own. 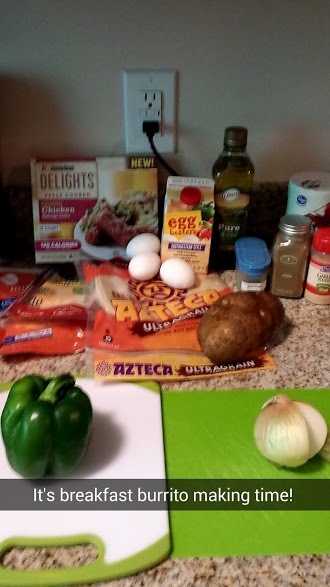 So I turned to Pinterest and found this frozen breakfast burrito recipe. I made a few tweaks though. Dice potato. In large skillet, heat olive oil, and saute potato chunks until soft and nicely roasted on the outside. This is a great time to be chopping your veggies while the potato cooks. 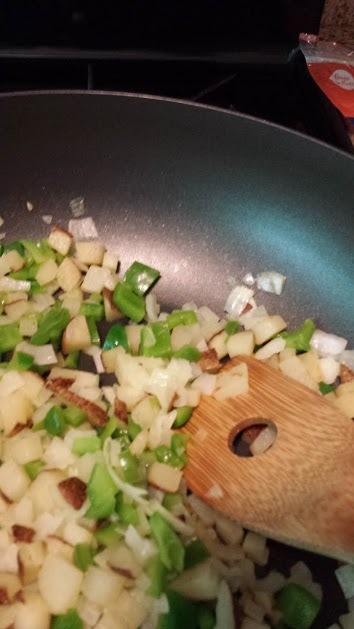 Add onions and bell peppers, stirring occasionally and cooking until they begin to get tender (4-5 minutes). Mix in cheese and stir together until cheese is mixed well and melting. Place tortillas on cutting board or clean surface and spoon mixture on each tortilla. To heat, I unwrap them totally, then wrap loosely in a paper towel, and microwave for one minute on each side on a microwave-safe plate. Let sit a minute or so and then devour! NOM NOM NOM. Hippity Hop! Easter’s on its way! My boyfriend and I dyed easter eggs today. 🙂 So fun. Yes, I’m pretty much five years old.